Jack Clark will no longer be working for Fox Sports Midwest next season. Apparently speaking your mind is not welcome in an industry that is founded on the freedom of speech. 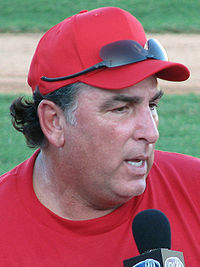 Clark made waves by calling out the team for hiring Mark McGwire in the off-season and then called the players out as quitters when they were losing miserably. Big Mac used roids. Clark lambasted him for it and said McGwire was a cheater. Well, Clark wasn't lying. As for the 2010 teas, all Clark did was base his opinion on the antics of a team that was losing. And many people agreed with him. I enjoyed Clark's commentary and his brutal honesty. If he didn't like something, he said so. It was refreshing. It was honest. And it was entertaining. Loser in this: Fox Sports Midwest.